You’ve accumulated too much credit card debt and something has to give! The monthly payments are more than you can handle and you’re heading for real financial trouble! The good news is that you are not alone. Thousands of people are taking advantage of the many debt relief options available today. But how do you know what they are and which one is the best for you? Let’s take a look. One of the more popular debt relief options is Bankruptcy. Many people don’t feel comfortable filing bankruptcy because they would be marked for life or it would be detrimental to their career. But keep in mind that in 2010, the banks lobbied Congress to make it much more difficult to file Bankruptcy and walk away from your debts. In fact, if you have an income, it may be impossible to wipe the slate clean with bankruptcy. If you are considering this option, you will need to consult with a reputable Bankruptcy attorney. Another option is Consumer Credit Counseling. The credit card companies learned a long time ago that some people can’t even pay their minimum payments. rather than watch them default with no hope to recover their money, they supported forming non-profit Debt Management firms where they send their troubled clients. Firstly, it tends not to give you a break in the amount you owe, which means you end up paying back 100% of your balance at a much reduced interest rate. Secondly, participating in a DMP is viewed as a negative item on your credit report that many lenders view much like a bankruptcy when it comes time to offer you new credit. 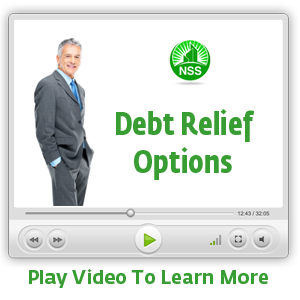 Another option for your debt relief is called Debt Settlement. It’s one of the more popular options when you want to do the right thing, you don’t want a public record of Bankruptcy and you want the opportunity to pay LESS than you owe. Debt settlement is an aggressive approach to debt relief where your creditors receive a smaller but equitable share of their money over time due to a demonstrated financial hardship you have experienced. Debt settlement plans last anywhere from 1-4 years and allow you to set aside a small amount that you can afford into a special purpose savings account that YOU control. As you build funds in this account, they are used to negotiate settlements with your creditors and ultimately relieve you of your debt. Because there is no bankruptcy involved and the goal is to settle the account in full for LESS than you owe, this is the best option for rebuilding your credit reputation. It shows you didn’t simply walk away from your debts and your creditors did receive their share. Our organization specializes in debt settlement AND you do not a pay fee until we settle your accounts one creditor at a time.